John came to us with very specific design ideas in mind for his warm-shell condo — great ideas, but more than we thought could be “comfortably” contained in a relatively small space. We essentially served as proactive design editors, helping him to narrow down his prolific ideas to an essential few. 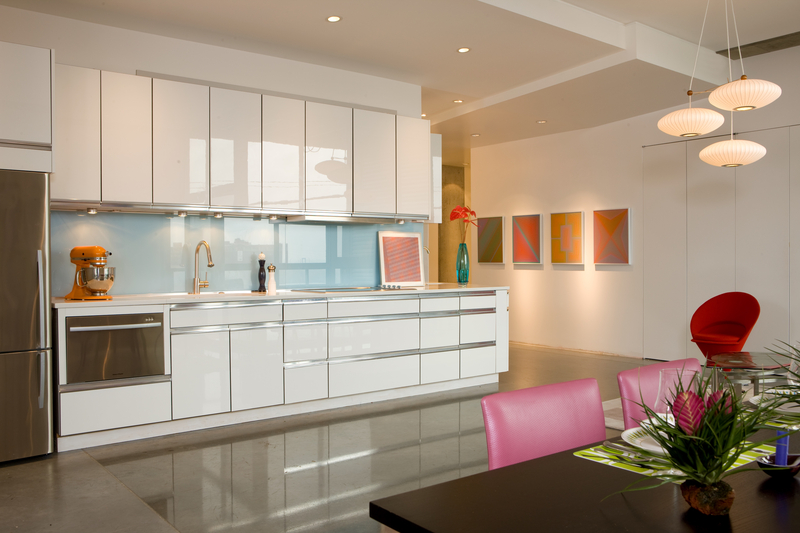 Our goal was to provide an architectural container that could hold his expansive collection of modern furniture and art in a way that kept pace with its dynamic forms and finishes without competing with their visual impact. “I have lived all over the USA and Europe in a variety of great places. I moved to Kansas City some 5 years ago and decided I wanted to create and build my own space. I was referred to Poolehaus through a friend as I was designing a 2000 sq.ft condominium space overlooking down town KC. What developed was a strong collaboration in which Bill was able to help me define my vision and enhance it with his creative and innovative ideas. The end result surpassed my original expectations and most importantly resulted in a space that is beautiful and marvelous to live in. It is an honor that my living space has been recognized in local and national publications and this would not have happened without Poolehaus’s contributions to the project. An added bonus was Bill’s great sense of humor which helped me weather the occasional set backs and frustrations along the way.